"A fabulous soup for all seasons! Warm in winter or cool in summer, this lightly spiced soup is a wonderful first course or a meal with cucumber salad and naan. Serve warm, though it is also wonderful chilled." Heat canola oil in a small skillet over medium heat. Cook and stir jalapeno peppers, ginger, and garlic in the hot oil until the garlic is soft and the oil is fragrant, about 5 minutes. Stir yogurt, chili powder, turmeric, coriander, cumin, garam masala, and salt together in a Dutch oven; warm gently over low heat. Fold oil mixture into the yogurt mixture, remove from heat, and top with cilantro. 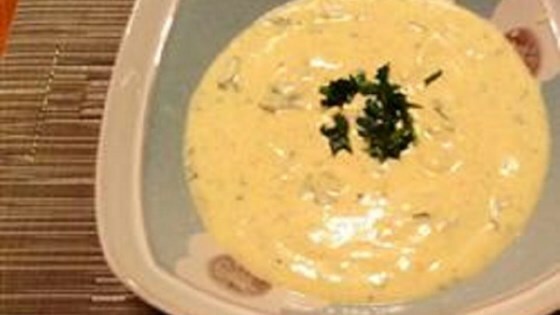 Discover the simple trick to delicious homemade creamy mushroom soup. This was okay but I was a little disappointed. Probably won’t make it again.